Heidi, you gave me 10 years of great friendship, security, and loyalty. I wish we could do them all over again, just slower, knowing how it ends. Its been 2 days, I miss you dearly. 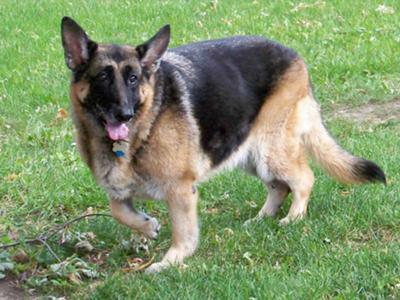 Tim, Chel, & Houston, I am so very sorry for your loss of your German Shepherd, Heidi. Let me say right up front that I am so very sorry for your loss. It is so very hard to lose a friend and companion German Shepherd at any time but your memories will help you through it all. Your memories will stick with you forever and help through your grieving process. But thank you so much for sharing your story about your German Shepherd Dog, Heidi, here with us all at Total German Shepherd. We all grieve with you. And to our readers, thanks so much for reading this story and please come back often to see what else is going on in our growing German Shepherd community. And if you get the chance please leave some feedback, place a video of your own or tell us your own German Shepherd story in our sharing section. And come back often as things will change daily.